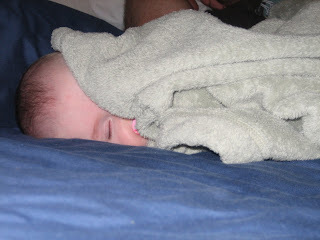 This is how I found Holly when I went to get her up from her morning nap. 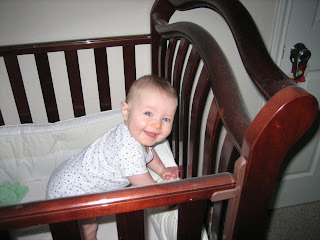 She is way too young to be standing up in her crib!!! We certainly had a fun Christmas together. Two days before Christmas, Holly started crawling. She was pretty slow and clumsy at first, but she's quickly gathering speed and tearing apart everything she can find. 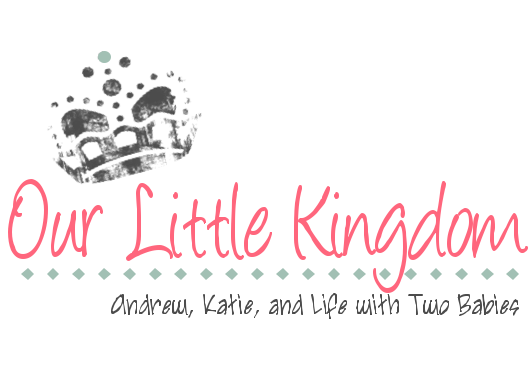 We spent Christmas Eve with Andrew's family and had a wonderful time. We didn't get back home until really late, so we were all tired on Christmas morning. 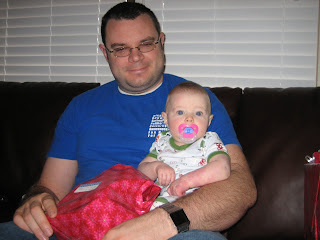 We had our own little present-opening session at our house first. Holly had a couple of presents to open at our house. 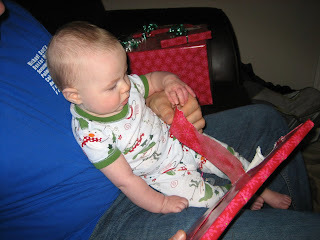 She loved the wrapping paper and the presents on Christmas Eve (when she didn't have any to open), but she wasn't interested at all in touching it on Christmas morning. Finally I gave in and unwrapped her presents for her. 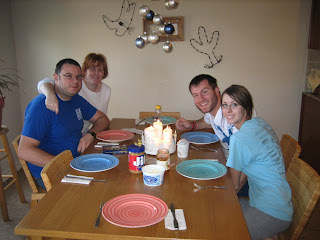 Then it was off to my parents' house to spend the day with them, my sister, and her fiance Josh. Josh and Emily in their jammies opening presents. 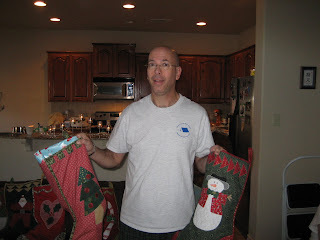 My dad handing out everyone's stockings. 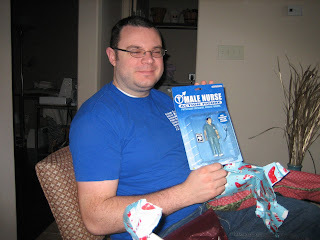 Andrew with his Male Nurse Action Figure. Gathered around the table waiting for our yummy pancakes! 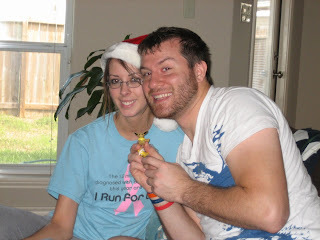 We had such a wonderful Christmas together. Holly has reached so many milestones since my last post! 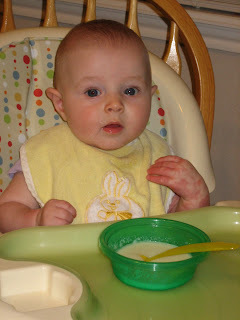 She started solid foods around the beginning of November, when she was five months old. She loved her little high chair right away but did not love food right away. However, she has since come around and enjoys pretty much anything we give her, as long as the texture is right. She also started sitting up on her own around this time. Woo-hoo! That was pretty exciting. It's so nice to have a baby who can sit up on her own! This also meant that I could finally stop lugging her around everywhere in her carseat. She loves sitting in the shopping cart. I think it makes her feel grown-up.